Two young Czech mountaineers have been lost under Triglav in the Julian Alps (Slovenia) since last weekend Saturday Jan 29th. "Hi, I send a Greetings from Thailand,"
Czech top climbing couple Tomáš Mrázek and Helena Lipenská wrote today in sms to CzechClimbing.com (Lezec.cz) and it´s readers . From 8a.nu: Tomáš Mrázek has onsighted Jui Dum, 8b at Railay Beach. Tomáš who won the World Cup 2004 goes to #2 position in the 8a.nu ranking and strengthen his position as beeing climber of 2004! 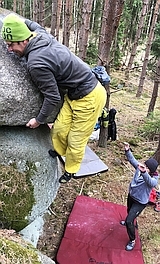 UK climbing.com has reported that Markus Bendler had accomplished a new 9a at Schleier Wasserfall!